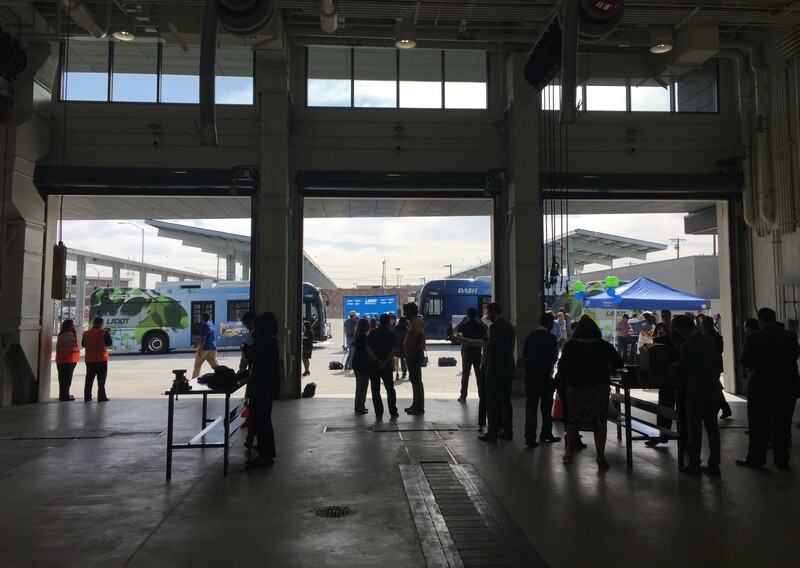 This morning transportation leaders and city staff celebrated the grand opening of the new L.A. City Transportation Department’s (LADOT) Transit Bus Maintenance Facility. The new buildings and yard are located on Commercial Street just east of Alameda Street, highly visible from Gold Line trains as they cross the 101 Freeway, just south of Union Station. The facility was designed by Gonzalez-Goodale architects and built by Sinanian Development. The project cost $42 million, which included land acquisition, design, and construction. The site includes: 77-bus DASH parking, CNG fueling stations, a two-story administration building, 98-space two-story employee parking structure, a six-bus bay maintenance facility, and charging facilities for 26 electric buses. 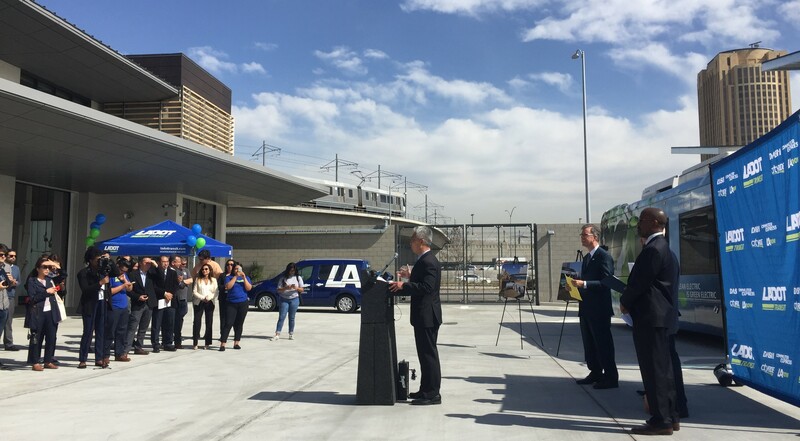 This morning’s celebration included remarks by L.A. City Councilmember Mike Bonin, LADOT Assistant General Manager Jay Kim, City Engineer Gary Lee Moore, Federal Transportation Administration Regional Administrator Ray Tellis, and others. Several speakers emphasized the mobility benefits of the facility, which is designed to support expansion of LADOT DASH transit. City Engineer Moore outlined the environmental features that earned the facility LEED platinum green building status. Sustainability features include: energy efficiency, rain capture and infiltration, solar panels, 30 new trees, and more. The frontage of LADOT’s new bus operations and maintenance facility. In March, the agency launched new LAnow on-demand shuttle service on the Westside. Phase Two of DASH expansion is slated for 2020; this will include increased frequency and new and modified routes. In celebration of the service expansion, all DASH rides on all routes will be free this weekend – Saturday and Sunday April 13-14.